In January 1979, Bull signed an Agreement with CPT corporation, a company based in Minnesota, USA, for the distribution of word processing equipment by Bull. Three 8000 series systems were bought from CPT and sold under the Bull label, the TTX-80, TTX-85 and TTX-90. These massive systems featured an Intel 8080 processor, 64 to 256 KB of RAM, a dual 8" floppy drive and above, a portrait monitor that could display a full page of A4. They were connected to a dedicated daisywheel printer and a 300-baud modem. They could be connected to a 61 DPS/2 Bull Computer through the "Buroth�que" software, allowing the documents to be sorted, archived or read directly from TTX system. The 61 DPS/2 then acts as a document server. The TTX-90 was the last machine bought by Bull. 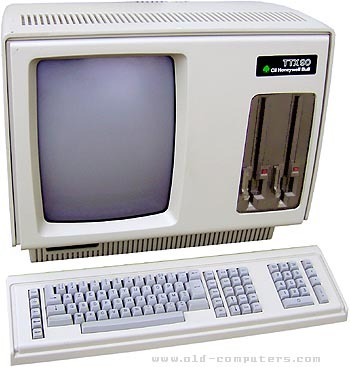 Because of the very high prices of the CPT systems (at least 15,000 Euros), they finally produced their own dedicated word processing system, the TTX-35. The TTX systems ran a very unique multitasking interrupt driven OS, able to save and retreive instantly a full A4 page of formatted text. However CPT did eventually offer standard CP/M 2.2 as alternate OS, though they did not call it CP/M. Due to its high price level, the TTX systems did not meet a large success, except in Bull offices and some French public services. There was an external hard drive available that was a 8" 30 Meg. (or was it 16"?) huge box called Wordpack and a little drive that held a 5/14 full height 5 Megabyte and later 10 Megabyte drive. There was also a Star Hub type server called the SRS45 which was a storage unit for multiple CPT computers. CPT Corporation started in 1971 In St. Louis Park, Minnesota, moved to Hopkins in 1974 then to Eden Praire in 1978. In 1981 they opened a seperate manufacturing facility in Channessan. They also offered 24 pin dot matrix printers and a 300dpi laser printer. Their first external hard drive was an external 14" 5Mb hard drive. The box was optioned for up to 3 drives. After that they came out with a 5 1/4" MFM-SCSI drives starting at 5MB and topping out at 30MB. see more Bull TTX 80 / 85 / 90 Ebay auctions !